Panels have a substantial feel to them. Material is a soft linen and the grommets are sewn on well. The grommet color can be considered chrome - a little brighter than grey but still matches the material well. At night from the outside with the lights on inside they offer great privacy. Not sure yet how they will block out the summer sun. Featuring a global medallion print design, Sun Zero Nepal Blackout Curtain Panels add global intrigue into any living space. 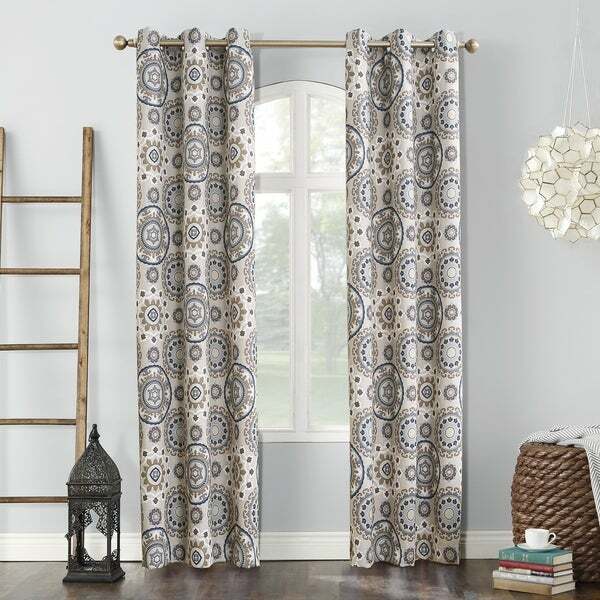 Equipped with built-in metal grommets for easy hanging on standard curtain rods up to 1.5" in diameter. Sun Zero Blackout technology blocks out most outside light, offers outside noise reduction by up to 30%, and decreases energy lost through your windows by up to 40%. Comfort is optimized with thermal properties that help keep summer heat and winter chill out of your home. Hang in your living room for enhanced privacy, or in your bedroom for a sounder, more uninterrupted sleep. Machine wash cold on gentle cycle. Use non-chlorine bleach when needed. Tumble dry on low heat, using a cool iron as needed. Nice and thick curtains and blocks out the light very well, the colors are very vibrant. Very good quality curtain and would highly recommend to others.